From flashy sequined blouses to floor-length lace dresses and conversational prints, I have recently found myself with a closet full of clothing and absolutely nothing to wear. I could have stood for hours in front of my wardrobe, pulling everything out and laying it on the bed, and come up with nothing. Although statement pieces can make great additions to a wardrobe, there are some drawbacks to a closet made up of them. First, nothing ever matches properly, and second, statement pieces aren’t very versatile. Most pieces in my closet were well-suited for a night on the town but wouldn’t have been officewear-ready at all. Getting ready for work in the morning was stressful since everything that could be worn to work was boring, which made me feel boring and unattractive. So, I decided it was time to strip down my closet and go back to the basics with a Capsule Wardrobe! A capsule wardrobe is basically a collection of garments and accessories that can all be worn together. Made up mostly of basic pieces in a specific color scheme, a capsule wardrobe makes getting ready for work or going out so much easier. With core colors surrounded by accents and basic garments embellished with simple accessories, a capsule wardrobe relies on layers and when done correctly, will always look put together and stylish. I love having a capsule wardrobe. With just a couple of pieces in my closet, I am able to get dressed in two minutes and I always look good. Everything matches so I could literally get dressed in the dark and I would still be confident that I look professional. In addition to that, I can dress all my clothes up or down with some well-placed accessories. A capsule wardrobe takes some commitment, so Mood has created the perfect print-outs to help you get started! From textures and colors to styles and silhouettes, everything about your wardrobe should be authentically you. 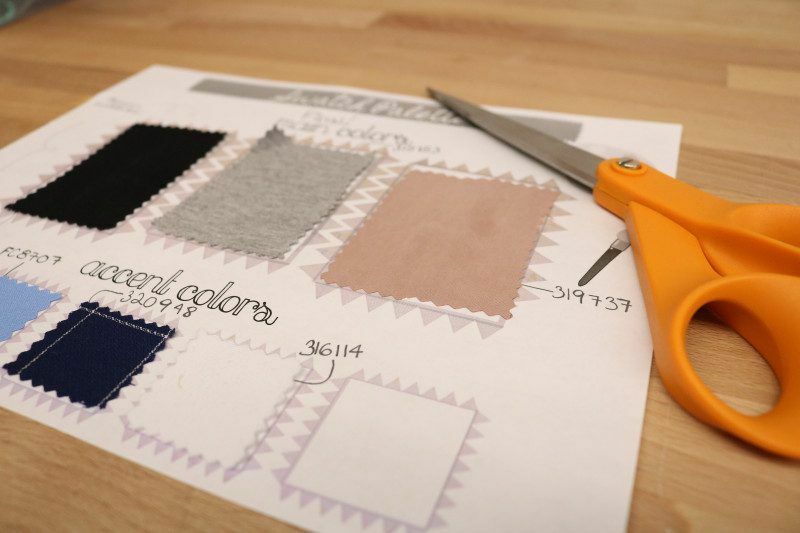 This might take some research, so I made sure to document my process so you could create your closet with ease. 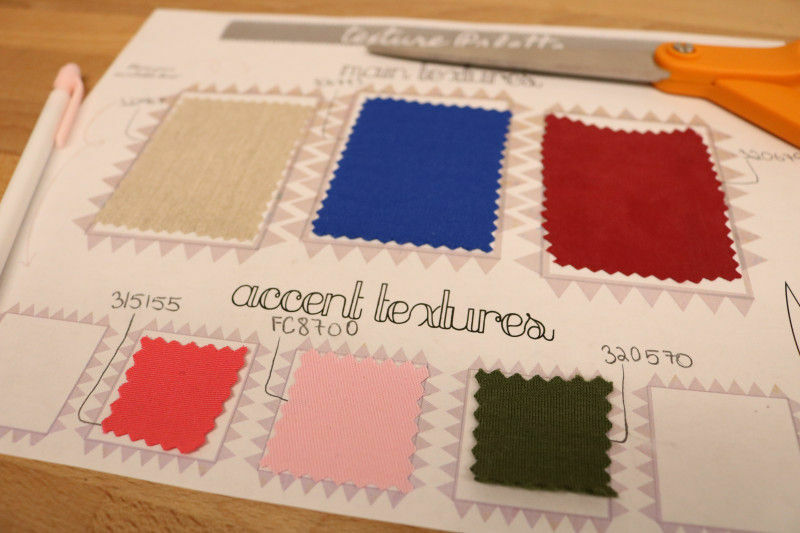 To start, download The Capsule Curator by Mood Fabrics for free below! The first step to any project worth finishing is research. For school papers, you’ll head to a renowned database and find studies that reaffirm your essay topic. For your closet, you go to Pinterest. In addition, a good paper always has a thesis, a kind of goal to help keep research in line. So, I created a “thesis” for my capsule wardrobe. I took a few minutes and wrote a small description of who I am and how my style reflects that. From those sentences, I came up with a name for my style; Professional in Pastels. With that in mind, I created two Pinterest boards to help nail down what I personally needed in a wardrobe. 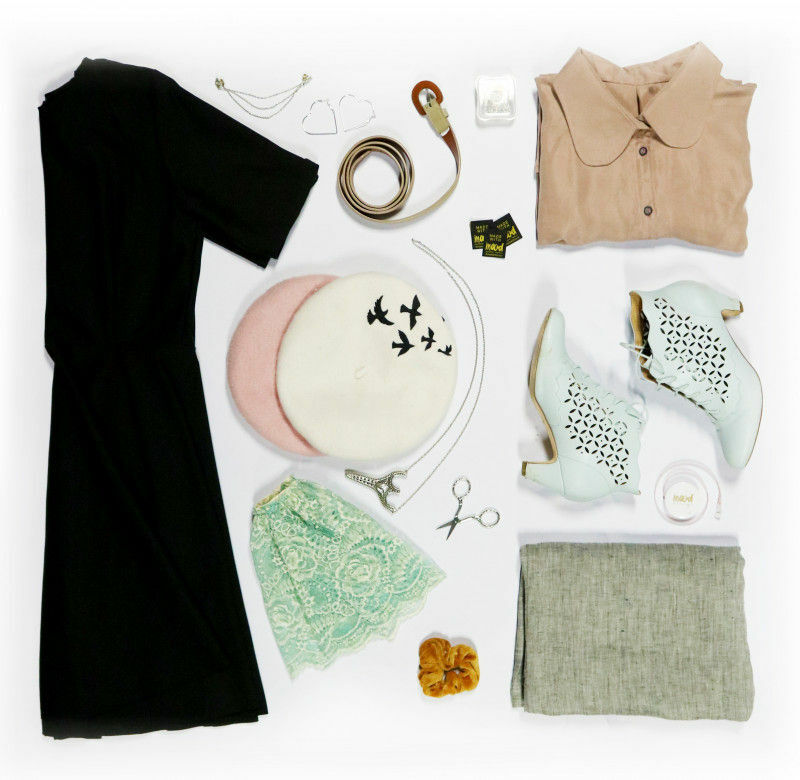 Although two boards might sound excessive, it’s vital to creating your capsule wardrobe. The first board is the “Dream Board.” The dream board exists in a perfect world where you have an unlimited amount of money and can wear whatever you want, regardless of where you’re going or what is flattering on you. Search colors and styles you like, or places you may go. 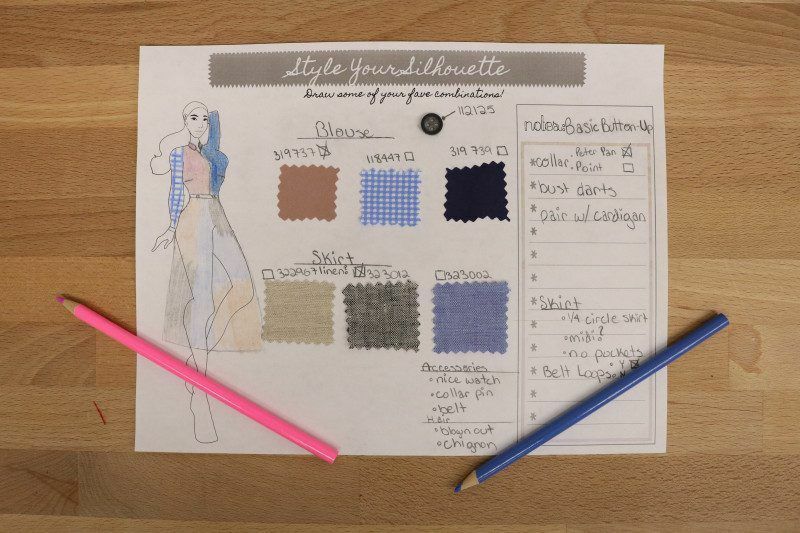 Look up officewear or layers, or check out one of Mood’s fantastic fashion boards! 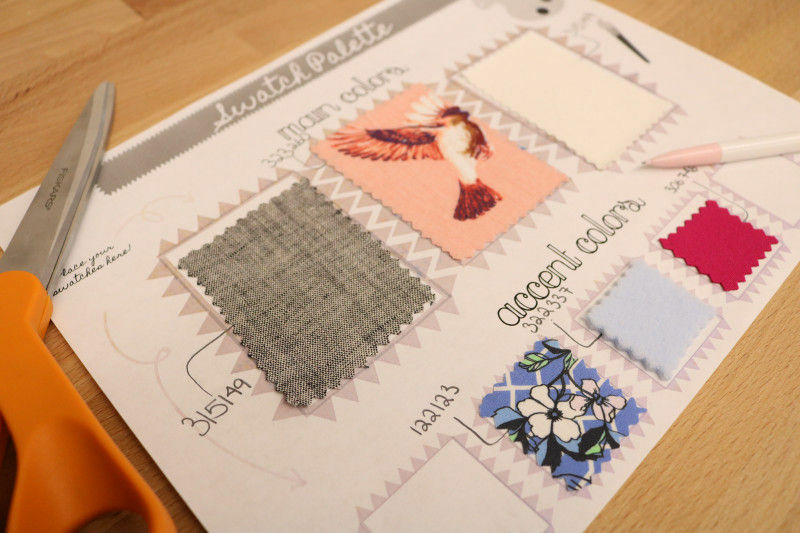 You can even head over to the Mood Sewciety blog and Pin patterns directly to your board. Once the Dream Board is fully fleshed out, you can make a second board. This second board exists in reality, so you should only pin garments you would definitely wear and have places to wear them. I titled this board “Professional in Pastels,” and kept that in mind while working on this board. Go through your dream board carefully, analyzing each piece. Yes, those sequined cigarette pants are fire, but something tells me they might be too distracting at work. Yes, I love ridiculously large statement sleeves but it might not be the best option when I’m trying to sew. Pin until you feel your second board is full, and then take a long look at what you’ve got. 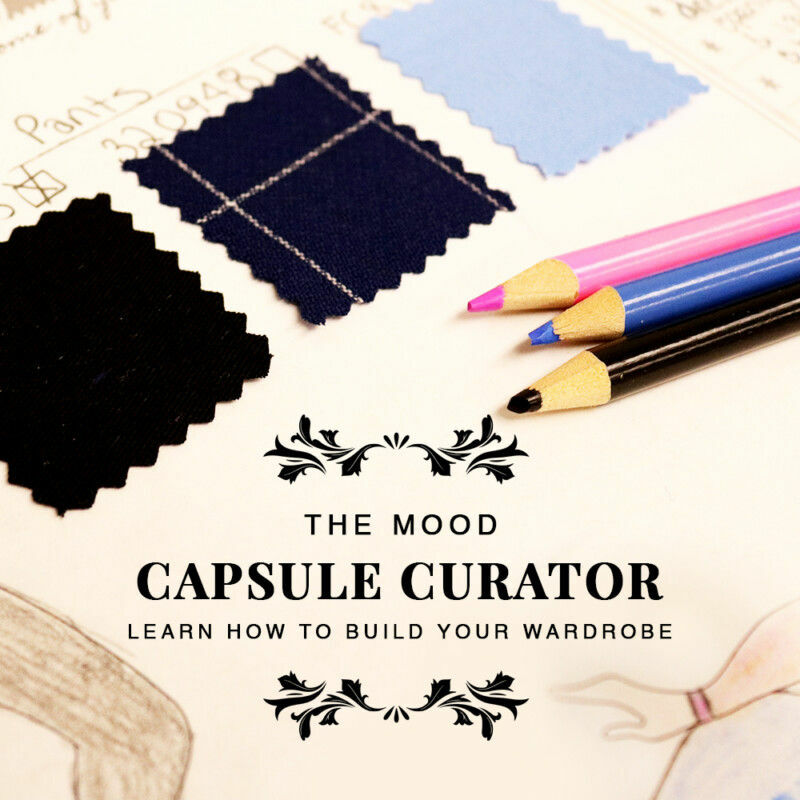 Once you’ve created your Pinterest boards, it’s time to start work on your Mood Capsule Curator! 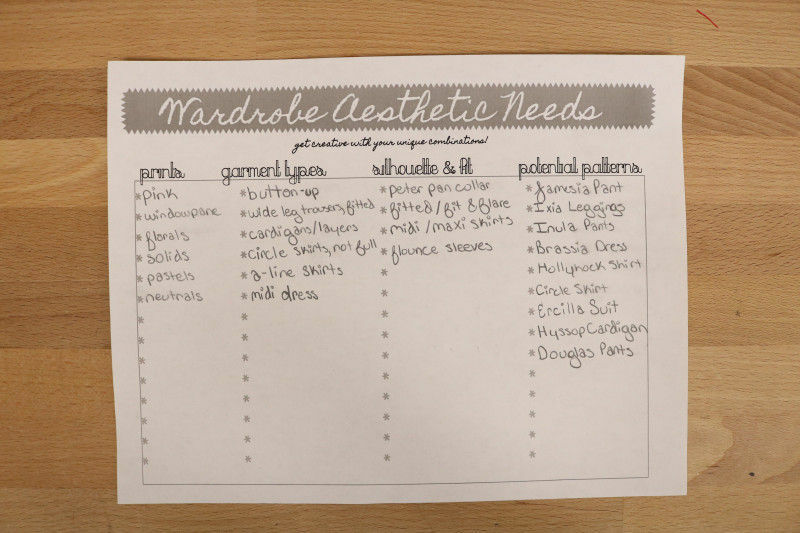 Turn to the first page, “Wardrobe Aesthetic Needs.” Here, you’ll see four categories; prints, garment types, silhouette & fit, potential patterns. Go through your second Pinterest board and take notes. Under the prints section, take note of colors and prints you are drawn to. I liked a lot of neutrals mixed with pastel pinks and blues, mainly solid colors, with some windowpane checks and florals thrown in. For garment types, I found I liked a lot of skirt/shirt combinations and loved layering with cardigans. Silhouette & fit showed that I preferred fitted looks overall with very few flowy pieces. 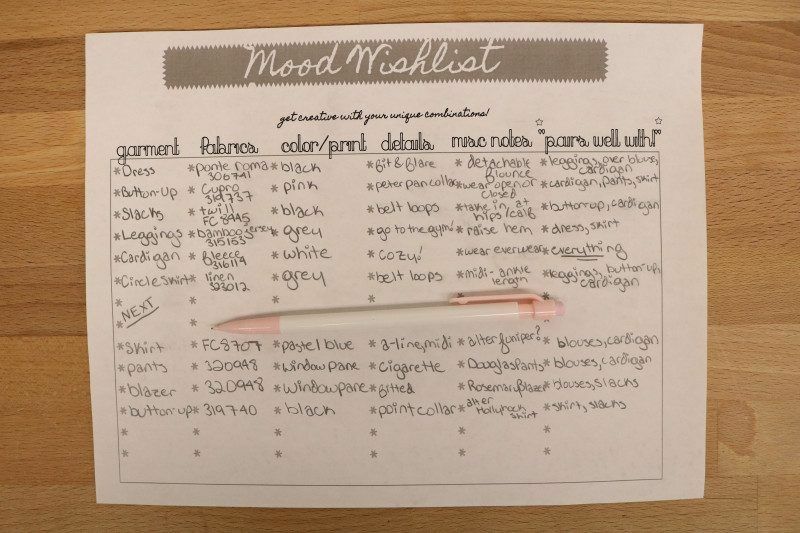 Once these first three sections are filled out, you can go to Mood Sewciety Patterns and find the patterns that fit well with your notes. 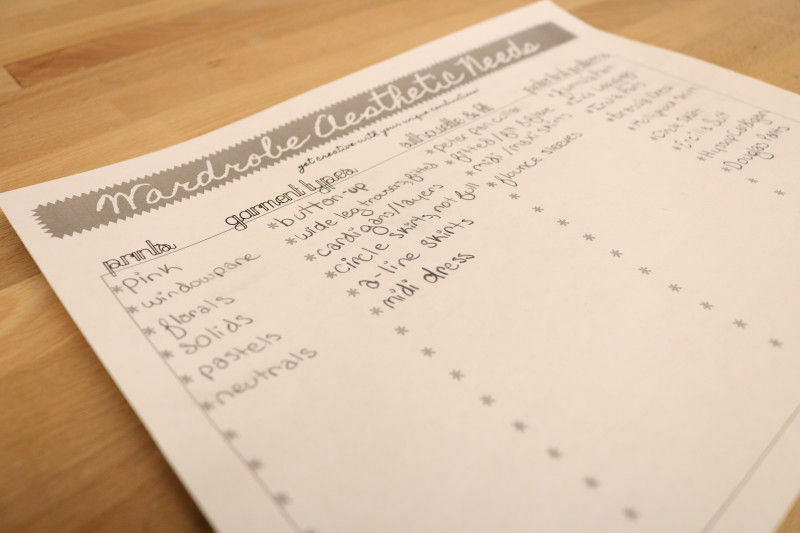 These notes are really important, as they’re a reflection of what you want to look like and wear. 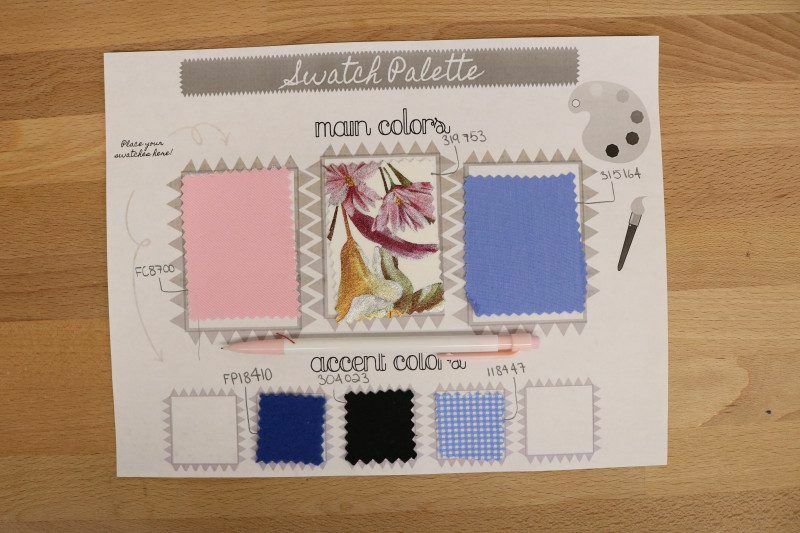 The next two sheets are your swatch palettes, which deal in color and texture. 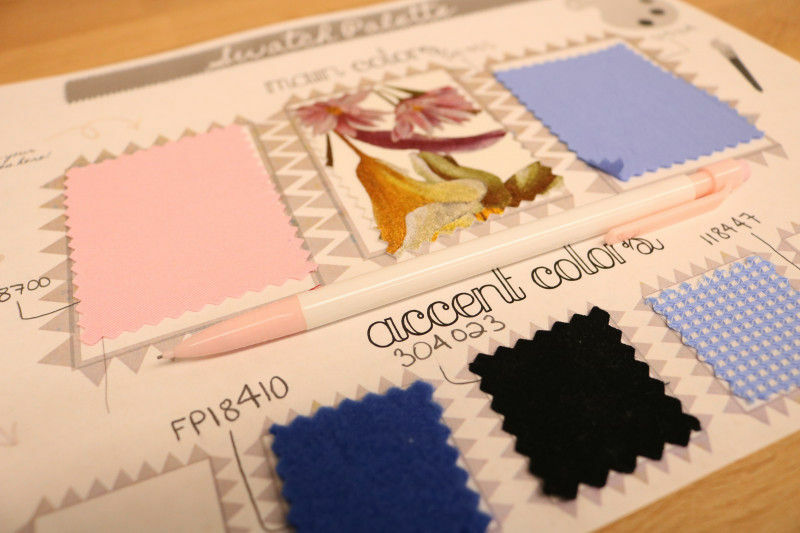 For color, you’ll simply look for swatches that have colors you like, and then you can play around with which colors will be your main and which will be accents. 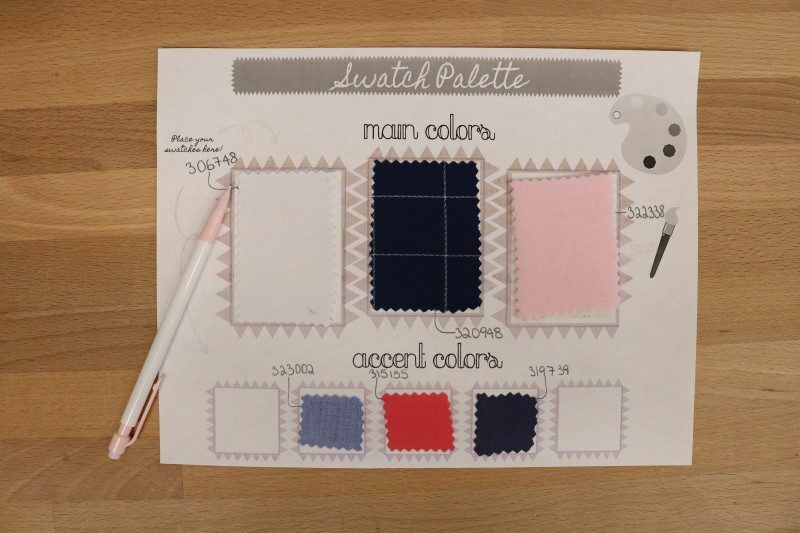 You can even throw in a print to see how it pairs with your overall color palette. 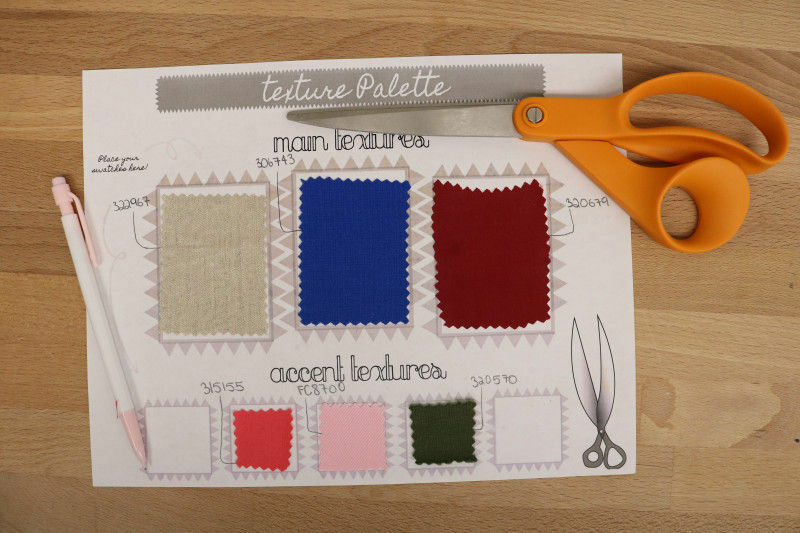 The texture palette is a little different and relies on the types of garments you like. Since I preferred fitted silhouettes and was not a fan of flowy styles, chiffon was not about the crop up on my texture palette. But twills or cotton sateens with some stretch have a pleasing hand, so these were featured prominently. 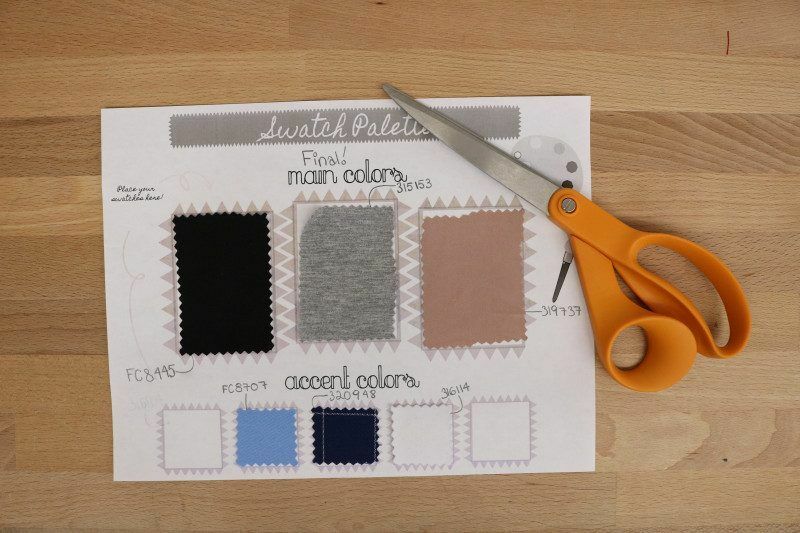 Once the swatch palettes were filled out, I took notes on what fabrics would feature the colors and textures I was interested in. 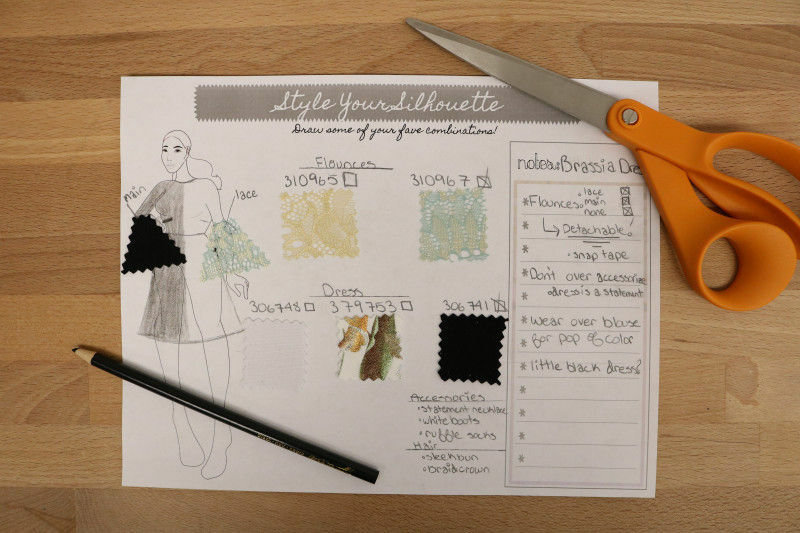 Next, you’ll work on the “Style Your Silhouette” papers. Mood made sure there were “straight” and “plus” sizes, perfect for imagining your own personal silhouette! 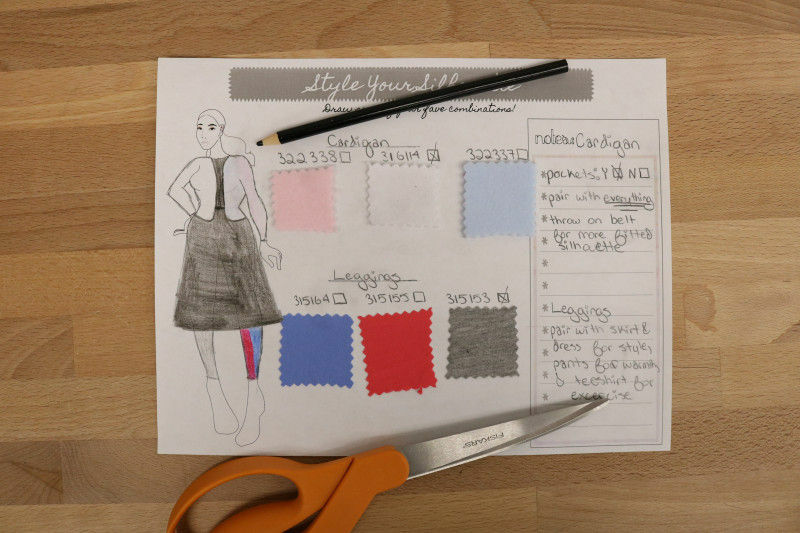 Draw in your favorite garments from Pinterest and make any alterations. Maybe you like the Peter Pan collar of one shirt but the sleeve of another, or the silhouette of a certain skirt but you want it in yellow. 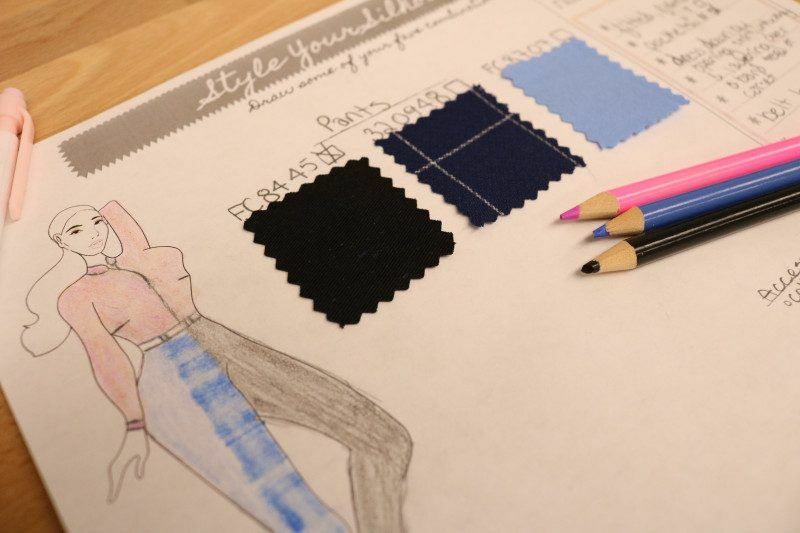 This is where you can really start to envision your personal style. 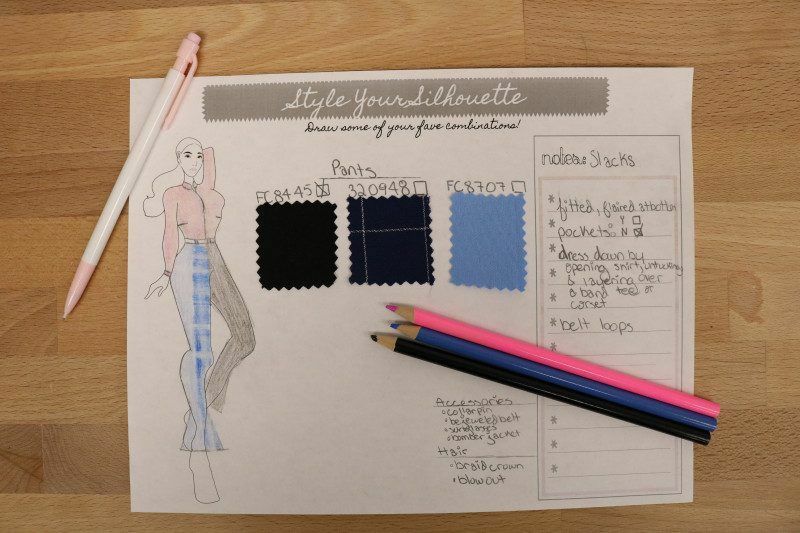 You can even draw the same garment a couple of different ways, layered or in different colors, to really figure out what you want in your closest. 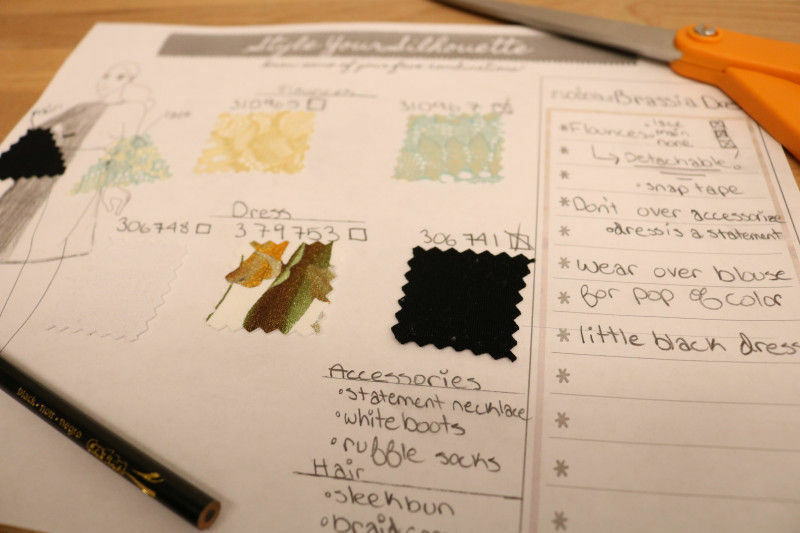 Take notes on the side about which garments you definitely need and what you might pass on. 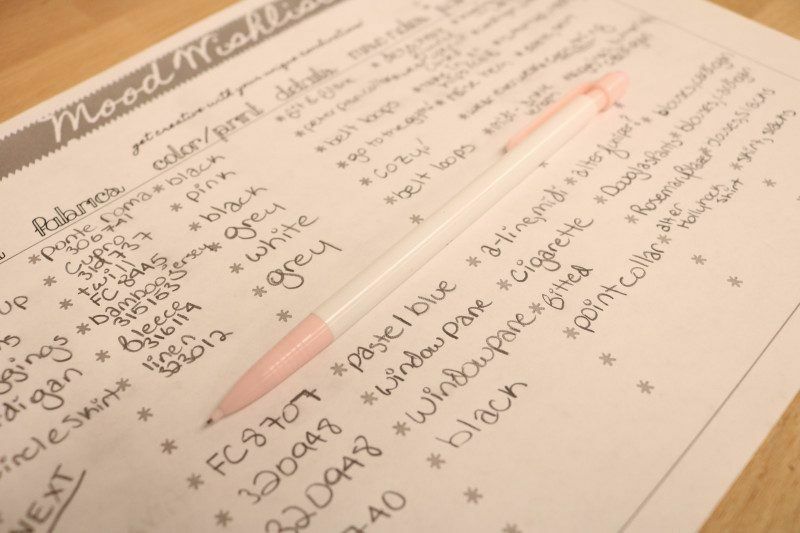 Moving on to the final page of your print out, you’ll find the “Mood Wishlist.” This is a list of garments you need in your closet, what they’ll be made of, and what you can wear them with. This is basically a checklist so that when you start making your closet you can stay focused on your needs and personal style. 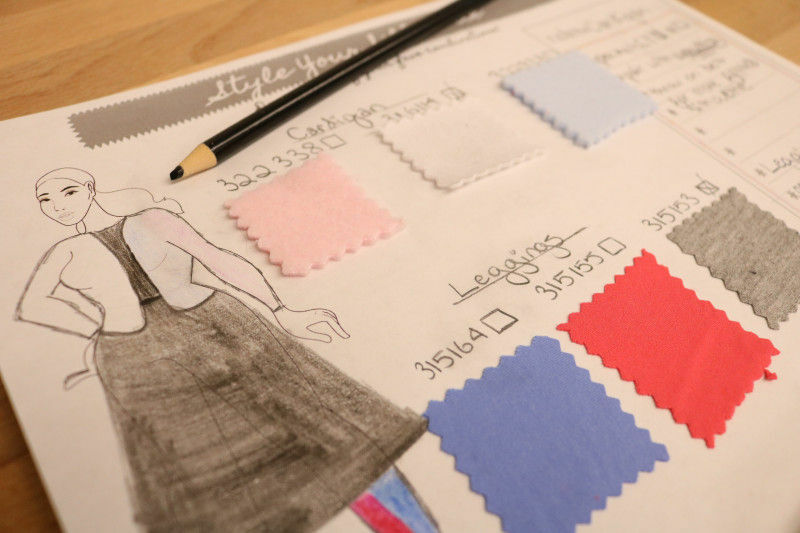 You’ll want to keep in mind what garments you’ll definitely need and how you can wear them. You don’t want three shirts if you don’t have any skirts or pants to wear them with. You don’t need eight skirts when you only have two blouses. For my closet, I chose one pair of pants, a shirt, a dress, a pair of leggings, a skirt, and a cardigan. These basics can be dressed down or up, paired with anything, and when I’m ready to expand, I’ll know exactly what I need in my wardrobe. With all that said, all you have to do now is actually make the clothes and go on a stunning photoshoot! For my wardrobe, I used the Brassia dress and the Jamesia pants for two simple black pieces that could be worn anywhere, with some subtle adjustments to fit my personal style. The Jamesia pants were taken in along the leg for a more fitted silhouette, while the Brassia Dress was given a detachable flounce sleeve to take the look from professional to party. I utilized Mood’s circle skirt calculator for a basic 1/4 circle skirt in a lovely shade of grey, and used three new patterns to fill out my wardrobe! The Ixia Leggings are simple and cozy, perfect for layering under a dress or paired with a tunic blouse. 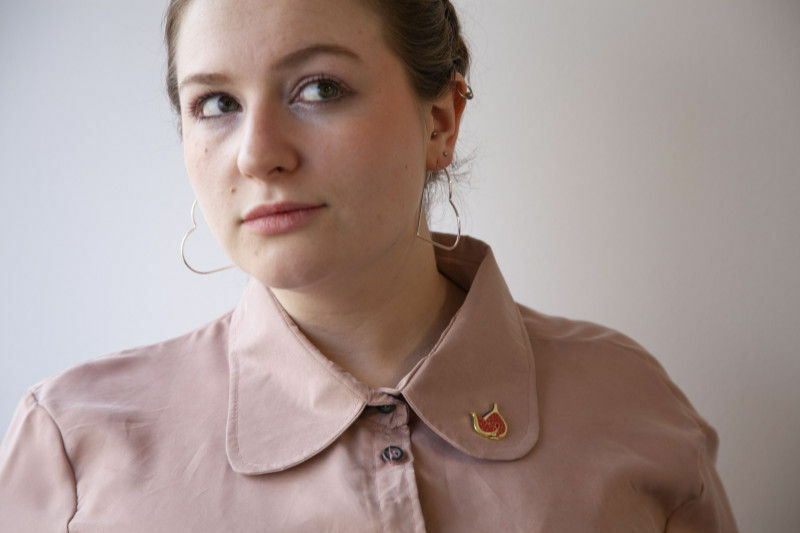 The Hollyhock shirt features a Peter Pan collar to give this basic button up a bit of bling. Finally, the lovely Hyssop Cardigan is the perfect piece to tie everything together! While creating my wardrobe, I kept two ideas in mind. One, don’t make it because you like it, but when it matches a majority of what you wear and will be worn a lot. When creating my Pinterest board, I pinned a lot of shorter skirts. Although I love the look of a mini skirt, they’re just not totally feasible when it comes to my style. I work in an office and most of my garments reflect that. I wouldn’t get much use out of a mini skirt, so I left it off the roster. The second idea I kept in mind was that I should make what I like and what matches my wardrobe, not what’s necessarily popular or in style. Of course, I keep up with the latest trends, but if tomorrow the fashion world decided pink was out and no one was allowed to wear it, I would be in crisis mode. If you love the way bell bottoms look on you, then make yourself some bell bottoms and pair them with confidence. I love how my wardrobe came out, the Mood Capsule Curator was exactly what I needed to get my closet back in working order. With fewer items in my wardrobe, it’s so much easier to get dressed, and I’m a lot more conscientious when buying new fabric to create with. There are so many ways to style your wardrobe, from different silhouettes to texture and color choices, the possibilities are endless and the garments 100% unique! 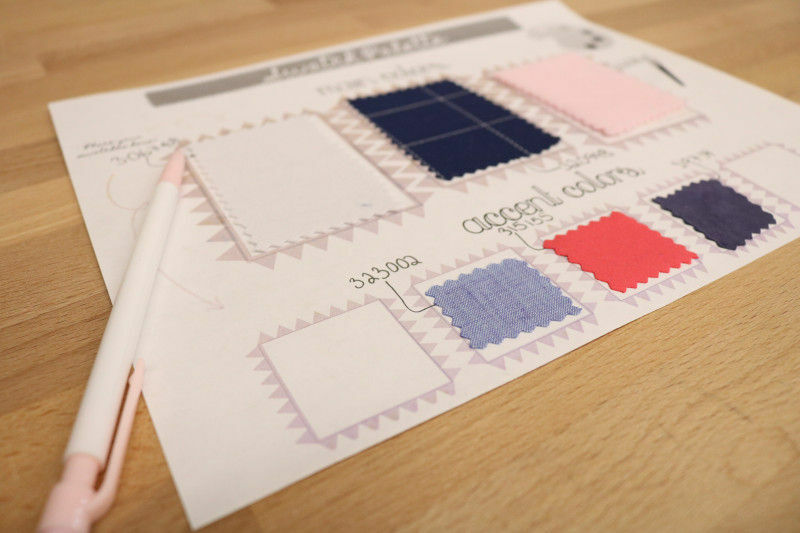 What patterns will you be using for your capsule wardrobe? Let me know in the comments! This article was inspiring. 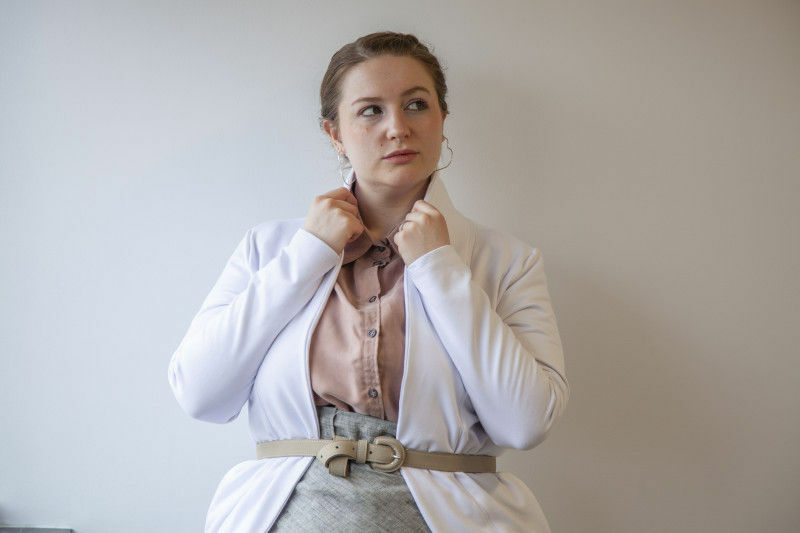 Similar to how women in 1930’s-40’s dressed to be efficient and classy, the capsule wardrobe will help modern women save money, the environment, and time, while feeling confident with their style! I especially appreciated the free printables to help build your new wardrobe. Lovely! I’m glad you felt inspired! I find that when I look at flash fashion trends, I’m always thinking about how the environment can keep up with the constant turn around of fashion and whether my wallet can handle it! It feels really good to be able to not worry about either of those things and just dedicate my wardrobe to being efficient, elegant, and well made, something I can’t really get at the store. Let me know how yours comes out, I’d love to see the variations people put in their own capsule wardrobes! You are rocking it girl! Thank you for the inspiration. Of course! 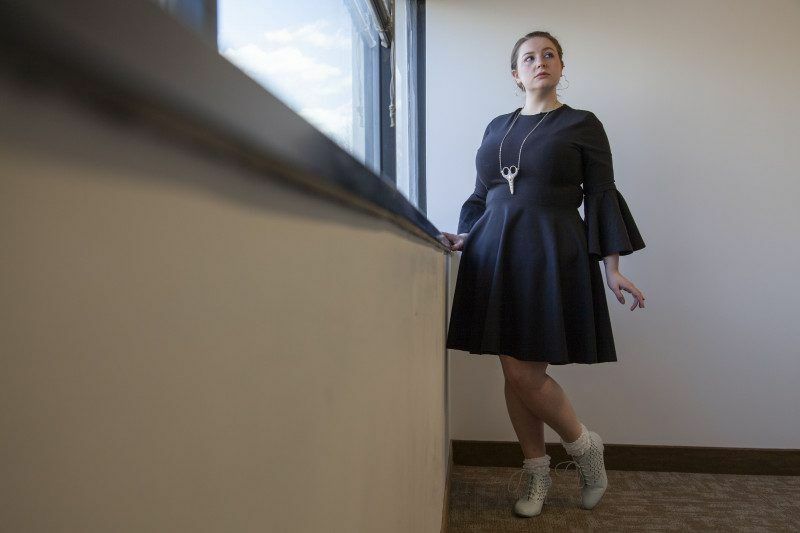 Fashion is such a powerful tool when it comes to feeling beautiful and confident, and that’s something that all people, of all shapes and sizes, deserve! Everyone deserves representation, and we strive to show that. Yesss – this is exactly what I’m looking for! I plan to amend the blocks for my shape, can you please tell me what cup size the tops are drafted to? Glad you like the post! I’m a 40F. If you want to change the pattern, check out the size chart. You usually want to accommodate for your largest measurement and then take in where needed, so you can accommodate your bust and take the waist in. You can also use a smaller size and adjust the darts. I love this blog Molly! Thanks so much. I’m currently reading the Curated closet and am going through the gathering info process – what I wear currently and Pinterest is my new best friend. I’ll definitely be downloading the Capsule curator. It will fit perfectly as I go through all of this! I’m so happy you like the blog! Happy to hear you’ll be curating your own capsule wardrobe, let me know how it turns out!! Great article! 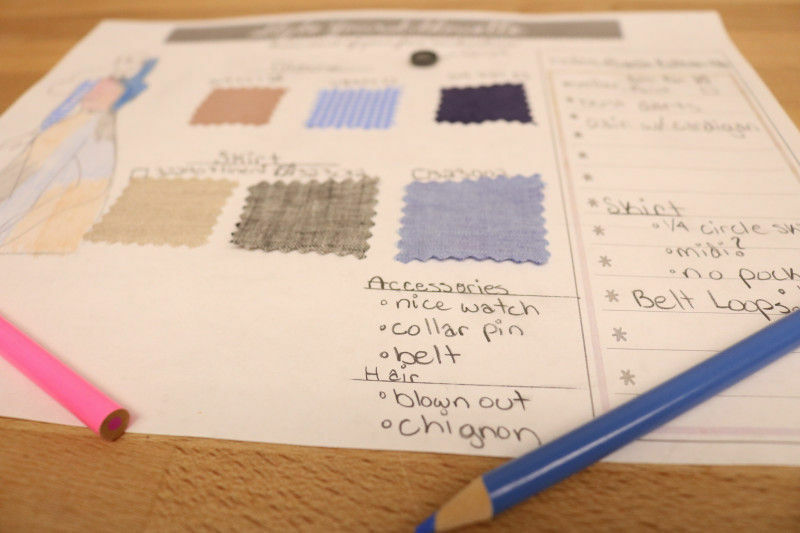 I love mood patterns and I would like to ask – do you plan to add more men’s patterns? I mean simple ones like hoodie shirt or sweatpants? Thank you, I’m glad you liked the article!! Mood has a couple unisex patterns, The Banksia Pant, The Avelia Bomber, and The Woodsia Shorts. We also have How to Sew a Men’s Shirt and The Daphne Jacket, which are both exclusively men’s patterns. Recently retired from my office career, I have a closet full of clothes I have no use for. Now I am rediscovering my creative side. Perfect time for a wardrobe overhaul, and you have inspired me to take a minimal, with quality, approach. Can’t wait to get started! Congrats on your retirement, that’s so exciting! Good luck with your wardrobe, and let me know how it turns out! Thank you for this! I am going to attempt to get started following your process! Wish me luck!